Americana Music Association and ACL to Present "Americana 17th Annual Honors"
NASHVILLE, Tenn. and AUSTIN, Texas (Feb. 7, 2019) — In partnership with the Americana Music Association®, Austin City Limits (ACL) returns to Nashville for a special broadcast offering performance highlights from the 17th Annual Americana Honors & Awards. The broadcast premieres Saturday, February 9 on PBS featuring a stunning revue of unforgettable performances celebrating the finest artists in American roots music. The hour is filled with musical highlights from Americana mainstays and next-generation stars, including many of the night’s award-winners and honorees, among them (in order of appearance): Nathaniel Rateliff & the Night Sweats, Lukas Nelson & Promise of the Real, Fantastic Negrito, Brandi Carlile, Tyler Childers, Margo Price, I’m With Her, Buddy Guy, Rosanne Cash, Jason Isbell & the 400 Unit, k.d. lang, Irma Thomas and John Prine. The special will be available to music fans everywhere to stream online beginning Sunday, February 10th @ 12 a.m. ET at pbs.org/austincitylimits and the broadcast premiere will launch February 9th on PBS and varies by market (check local listings for times). Austin City Limits airs weekly on PBS stations nationwide and full episodes are made available online for a limited time at pbs.org/austincitylimits immediately following the initial broadcast. Viewers can visit acltv.com for news regarding upcoming Season 45 tapings, episode schedules and select live stream updates. The show's official hashtag is #acltv and viewers can also use #americanafest for this episode. For the eighth consecutive year, the producers of Austin City Limits, in conjunction with Two Talented Cats, and the Americana Music Association, are proud to present a special ACL Presents to close out Season 44. Recorded live at Nashville’s historic Ryman Auditorium on September 12, 2018, the Americana Music Association’s 17th Annual Americana Honors & Awards ceremony is a celebration of the diverse sounds of roots music, from folk, bluegrass and alt-country to R&B and the blues. The show opens with a scorcher: a spirited cover of “Fortunate Son” featuring two of the night’s honorees, Nathaniel Rateliff and Lukas Nelson, joined by blues standout Fantastic Negrito, trading verses on the Creedence Clearwater Revival classic, augmented by the stellar vocals of famed gospel group The McCrary Sisters. Multiple nominee Brandi Carlile hits the stage with her band and a six-piece string section for an epic performance of "The Joke," nominated for Song of the Year. The year’s Emerging Artist Award-winner Tyler Childers performs a gripping, acoustic “Nose on the Grindstone” detailing the perils of coal country and opioids. Artist of the Year nominee Margo Price thrills the Ryman crowd with a walk into the audience during her performance of "A Little Pain," a Song of the Year nominee. Group of the Year nominees showcase their bona fides: Nathaniel Rateliff returns with his band The Night Sweats for a rousing “Hey Mama”; Lukas Nelson & Promise of the Real deliver a passionate “Forget About Georgia”; and super-trio I’m With Her (featuring folk mavericks Sara Watkins, Sarah Jarosz and Aoife O’Donovan) perform acoustic in gorgeous, three-part vocal harmony. One of the genre’s top stars, Jason Isbell, sweeping the night’s top honors for Artist, Album and Group of the Year (with his band the 400 Unit), performs the riveting social gut-punch “White Man’s World” from his award-winning album "The Nashville Sound." Songwriting marvel John Prine is honored with Artist of the Year for the second consecutive year, and plays a captivating new gem, “Summer’s End,” from his acclaimed latest release "The Tree of Forgiveness." The award’s Lifetime Achievement Award honorees take the stage to showcase their talents: Trailblazer honoree k.d. lang performs her phenomenal "Trail of Broken Hearts"; New Orleans soul queen Irma Thomas, the year’s Lifetime Achievement Award honoree for Performance, delivers an electrifying version of her iconic "Time Is On My Side” to a standing ovation; Blues legend Buddy Guy earns a Lifetime Achievement Award for Instrumentalist, and rocks a blistering rendition of one of his signature six-string numbers, "Damn Right, I've Got The Blues." Rosanne Cash, the recipient of the Spirit of Americana “Free Speech” Award, whose late father Johnny Cash was the inaugural recipient of the award, takes the stage to perform a heartbreaking new song, "Everyone But Me,” reminiscing about lost loved ones, including her late parents. A show-closing tribute is paid to a game-changer in American roots music, the late, great Aretha Franklin, as all-stars Brandi Carlile, Irma Thomas, rising Americana stars Courtney Marie Andrews and husband and wife blues/soul duo The War and Treaty, along with gospel great Ann McCrary come together for the finale to sing "Chain Of Fools," bringing the audience to their feet. Buddy Miller returns as reigning musical director with an Americana All-Star Band featuring Don Was, Jerry Pentecost, Joe Pisapia, Ian Fitchuk, Lillie Mae, Joshua Grange, Jim Hoke, and The McCrary Sisters backing many of the night’s performers. The show was co-produced by Two Talented Cats Entertainment’s Martin Fischer and Edie Hoback, Michelle Aquilato and ACL Executive Producer Terry Lickona. For images and episode information, visit Austin City Limits press room at http://acltv.com/press-room/. For more information on the Americana Music Association, please visit americanamusic.org. The 20th annual AMERICANAFEST®: The Americana Music Festival & Conference will take place September 10-15, 2019. The event brings together fans and music industry professionals alike, offering six days of celebration through seminars, panels and networking opportunities by day and raw, battery recharging showcases each night. The Americana Honors & Awards Show is the featured performance of the festivities, taking place at the historic Ryman Auditorium. For information, please visit www.americanamusic.org. The Americana Music Association® is a professional not-for-profit trade organization whose mission is to advocate for the authentic voice of American roots music around the world. The Association produces events throughout the year; including AMERICANAFEST®: The Americana Music Festival & Conference and the critically acclaimed Americana Honors & Awards program. The Americana Music Association® receives enormous support from the Tennessee Department of Tourism, Nashville Convention & Visitors Corp, Lagunitas Brewing Company, Mountain Valley Water, ASCAP, BMI, SESAC. ACL Presents is music programming created by, or in association with, KLRU, the producers of Austin City Limits (ACL). 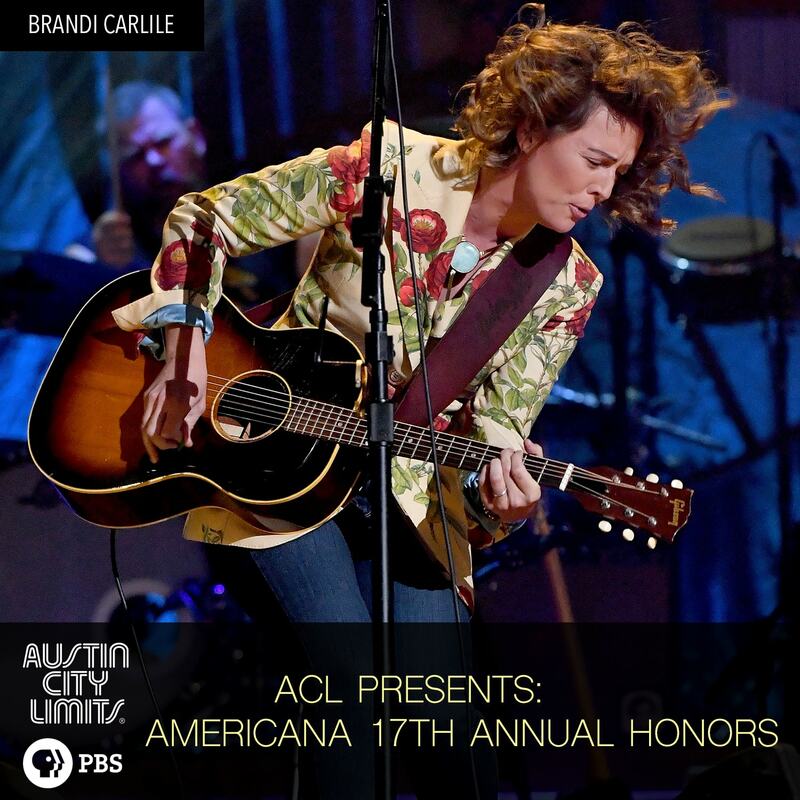 ACL Presents programming includes television specials, live events, web series and recorded music presentations and is made in the spirit and standards of the legendary PBS series Austin City Limits, the longest-running live music series in television history. ACL Presents collaborations have included: Hardly Strictly Bluegrass with KQED and Americana Music Festival with Nashville Public Television (NPT). Austin City Limits (ACL) offers viewers unparalleled access to featured acts in an intimate setting that provides a platform for artists to deliver inspired, memorable, full-length performances. The program is taped live before a concert audience from The Moody Theater in downtown Austin. ACL is the longest-running music series in television history and remains the only TV series to ever be awarded the National Medal of Arts. Since its inception, the groundbreaking music series has become an institution that's helped secure Austin's reputation as the Live Music Capital of the World. The historic KLRU Studio 6A, home to 36 years of ACL concerts, has been designated an official Rock & Roll Hall of Fame Landmark. In 2011, ACL moved to the new venue ACL Live at The Moody Theater in downtown Austin. ACL received a rare institutional Peabody Award for excellence and outstanding achievement in 2012. ACL is produced by KLRU-TV and funding is provided in part by Dell, the Austin Convention Center Department, Shiner Beers and HomeAway.com. Additional funding is provided by the Friends of Austin City Limits. Learn more about Austin City Limits, programming and history at acltv.com.